Sony, a supplier of camera modules used by Apple, has unveiled a new image sensor for smartphones that has its own onboard DRAM, allowing it to capture HD video at far higher frame rates than current generation smartphones are capable of filming. Announced today, the new CMOS sensor uses a three layer stack structure instead of the typical two-layer stack used in other modules. Joining the layers of back-illuminated pixel structure and signal processing circuits is a third layer, one that holds dynamic random access memory (DRAM) dedicated for use only by the camera module. By sandwiching the DRAM layer in the middle of the stack, the module is able to capture images at a higher speed than before. Sony claims the memory is able to read one 19.3-megapixel still image in 1/120 of a second, approximately four times faster than conventional imaging modules. This high-speed dedicated memory gives the camera two major advantages, for both still images and for video. The faster reading of each pixel line minimizes the focal plane distortion caused by photographing objects in motion, which usually makes subjects appear slanted to one side in stills, and causes a wobbling effect in video. The other advantage is the ability to capture high frame rate video at a high resolution. Sony claims the module is capable of recording 1080p video at up to 1,000 frames per second, eight times the 120fps rate of the iPhone 7's camera, which can be used to create slow motion footage with items moving at a far slower speed. 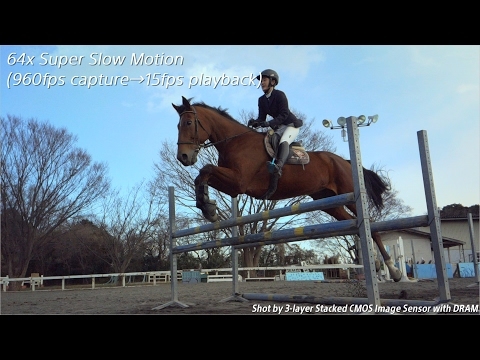 Sony claims the module is also able to be set to automatically capture sudden movement of subjects in a super slow motion movie, allowing users to record in slow motion an opportunity they may have otherwise missed. The initial production module that will use the technology will have an effective resolution of 21.2 megapixels, and will be able to capture still images at 19.3 megapixels at 30fps, 4K video at 60fps, and Full HD at 240fps. The DRAM capacity of 1 gigabit, effectively 125 megabytes, suggests the extreme frame rate mode will only capture a few seconds of footage at a time, before passing it off to the smartphone's memory. Sony has yet to confirm if the module has gone into production, or if it will be using it in one of its Xperia smartphones in the future. Considering Sony supplies camera modules to other smartphone producers, including Apple, there is a possibility the announced module could make an appearance in a future iPhone iteration. Good for Sony. Now they need to create a true optical zoom capability that's more than the "standard" lens on the iPhone 7 Plus. Get the interface between the camera's DRAM and the iPhone storage going at the highest speed possible and this configuration could create a viable videographer's tool for a real movie. Likely going into the next iPhone. The iPhone has always had the highest transfer rates from the sensor to processor (which is why iPhone slomo has always outperformed others). This is just the next logical step to offer super slomo and higher burst rates. So Sony is now demoted to simply being labeled "iPhone Camera Maker"? They supply sensors for other cameras, including Nikon and Hasselblad. That is so super cool. The iPhone has already been used to create "real movies" (and one was even nominated for an Academy Award, for whatever that's worth). Agreed...too many think they are a pro photographer just because they have a good camera. It takes a lot more than that. If this makes into my next iPhone, I'm going to have to go out and buy a gun and an apple (fruit). On the other hand, technology goes a long way in reducing the skill required to capture certain kinds of shots. For sports a key skill was the ability to capture the best moment with a single frame. Reduced somewhat with 5-10 fps shooting. If you can get 19MP RAW shots at 30 fps you don't really need this skill anymore. You need to just work on your composition skills and have a half decent understanding of the sport you are shooting. By the way, I've been highly impressed with the quality images pro photogs can get with cheap toy cameras. That has always been the case. FFIW all you need to take astounding photos is, say a 20x16 inch dark slide, a box with a pinhole, and a piece of photographic paper. The photo paper can be used as a negative to make another paper contact print. So you do not need lenses, film or enlargers to make analogue prints. Plus you get an otherwise unobtainable depth of field. I agree: seems strange to refer to Sony that way. Also, I came here to pick a bone with AppleInsider. Why does the headline call out "optics"? To me, the optics mean the lenses - what actually makes it possible for Sony to get these incredible frame rates is really what Sony did with the sensor and memory. Great lenses certainly help - but they're not the major driving factor in Sony's latest accomplishment. So, what's my complaint? I really wish AppleInsider would be more accurate in their reporting. I came back to add that I'm a yearslong reader. I tend to "lurk" and catch up on all that is Apple and seldom post. I don't have statistics to back it up, but I feel that this is becoming more of a problem. I think Sony being referred to as "a supplier of camera modules used by Apple" is pertinent to the story at hand. Granted, Sony is much more than that, but in the context of Apple, Sony is a camera supplier and they have some exciting new technology that may find its way into future iPhones. Nothing wrong with the usage and no offense to Sony here. OT, but does anyone know if the telephoto lens on the 7 Plus captures video also? Sometimes when capturing video and tapping to the 2X zoom, the quality become dodgy - more like a digital zoom rather than an optical one. I vaguely recall something about the telephoto lens not doing video, but I may be mistaken. Either that, or there wasn't enough ambient light for the zoom to be clear in my scenarios.